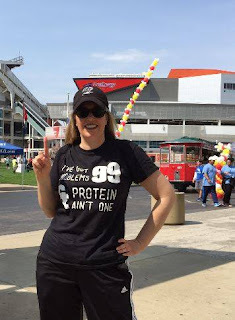 "I've got 99 problems & protein ain't one"
You may recall from the post, "I Poisoned Myself," I have recently suffered an MS attack - one that I can now classify as my worst attack. Upon discovering what caused this attack, I hope my last. But, with every attack comes recovery - more specifically rehab. Something I am quite familiar with given my many, many years of unknowingly living with MS. This time around, I hit the treadmill to rehab. I had just gotten into the habit of walking prior to the attack and I was mad that my new found activity was abruptly taken from me. This attack left me with substantial muscle atrophy, so getting on a moving machine was a bit scary, but I was determined. I set my realistic expectations and began my long walk to recovery. Day 1, I did a stellar 1 mph for 3 minutes & was exhausted. I know that may not seem like much, but after being bedridden for four weeks, it was an amazing accomplishment and I was proud. Until I was asked to participate in a 5k to benefit The Hunger Network of Greater Cleveland. Completing a 5k has been on my bucket list for a while, so I "jumped" at the chance. Mind you, at the time, I wasn't walking anywhere near 3.1 miles and running was not even a consideration. I was still experiencing symptoms from my attack - fatigue, numbness, and vertigo. To anyone else, this would have seemed like a crazy thing to consider. But, to me I thought it was an excellent opportunity to push my body into recovery using my mind... I had one month to work up to 3.1 miles. I had no idea if I could do it or not, but just having that mental goal kept me trying. The mind is a very powerful tool and my theory was by concentrating on a specific date to physically compete, my body would come along. And come along it did! On May 7, 2016, I completed my first 5k. Sure, it took an hour, but I crossed the finish line on my own and kept on going! The moral of this story is to have a goal and pursue it. There were many, many times that I could have said - this is too hard, it hurts too much, my body won't let me do it - but I pushed through all that. Originally, my goal was just to walk again, but then it became so much more and there's no going back. P.S. Thanks for the encouragement to keep pushing, I needed that reminder since I've been going through lots of fatigue and getting weaker because I am sleeping way too much.